Hundreds of Bullfrogs Take Over Coffman Park in Dublin OH! Anyone visiting Coffman Park in Dublin, Ohio for the first time this Saturday (June 26) might think they’ve landed smack-dab in the middle of a low-budget thriller movie as hundreds of amphibian athletes taking over the park during the 44th annual “Dublin Kiwanis Frog Jump.” Dublin’s oldest and longest running event is one of those things that you have to witness for yourself. Best of all, it’s cheap family fun. For just a $1 per person entry fee—you can rent a frog and test your mettle. In addition to the slimy competitors, thousands of young “Frog jockeys” (ages 13 and under) are expected to bring their game faces and their best strategies. Elimination races begin at 10 a.m. Serious competitors select the perfect bullfrog from a large tank (or they can bring their own)—then head to the competitive rings where they face-off against other frog/coach teams. The human competitors stand back-to-back in the center of the circle, placing their frog friends on the grass. They wait for the signal. And they&apos;re off. Fans scream and cheer. 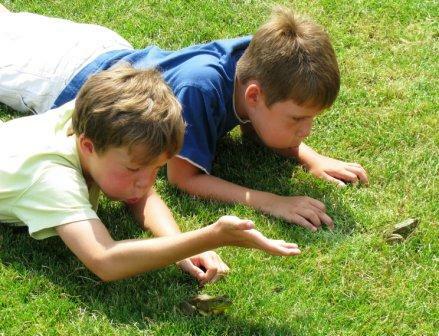 Young frog jockeys hit the ground behind their frogs (no touching is permitted) or blow on them to encourage movement. The frogs leap (if they feel like it). Or they sit. Kiwanians referee. The first frog that hops outside the large circle wins! 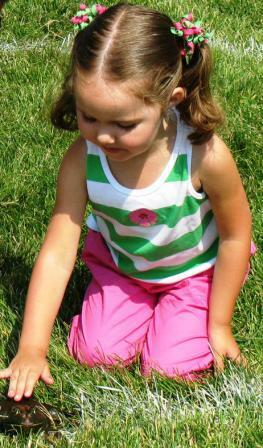 Little ones (frog-jockies-in-training) can test their skills--or just see if they can handle one of the slimy, warty guys--in the non-competitive “Kiddie Rings.” Parents are invited to help out. Every little competitor here gets some kind of token prize just for taking part. Competitors fall into one of two different age brackets; ages 8 and under or ages 9-13. (Sorry—but if you are over 13, you can’t compete for prizes.) Older kids who win three races in a row earn a spot in the playoff rounds which begin at 3 p.m. And, yes, there is a championship round. Athletes that make it to this round—well, let’s just say they’ve busted the myth that there is no real strategy behind this type of athleticism. (But don’t ask them to divulge their secrets.) Past prizes for the champions have included new bicycles, Ipods, Columbus Clippers tickets, etc. Visitors to the event can enjoy a variety of refreshments and other activities including sack races, inflatables and more. As you might have guessed, preparation for the event begins well in advance. Local members of the Kiwanis Club of Dublin take the business of frog catching VERY seriously. “There are some die-hard frog catchers in our club that are dedicated to this task every year,” said Clay Rose, Treasurer & Co-chair of the Annual Frog Jump. “They go out at night to Dublin area ponds with flashlights and pillow cases.” Rest assured that the frogs are treated humanely and are returned to the ponds after the event. But do the amphibious volunteers make it back to their original pond homes? “Let’s just say we encourage biological diversity,” Rose says. Dedicated to ‘serving the children of the world,’ the Kiwanis is a fellowship oriented organization. And the Frog jump is a big fundraiser for the Kiwanis Club of Dublin. Half of the event profits are split between NAMI Ohio (National Alliance for Mental Illness) and the Dublin Food Pantry. The other half of the profits help to fund the club’s year-round projects—including key clubs and boys/girls organizations.